So as I sit here and type this I had to put the book down, even before I had finished it. I just had to get some thoughts out while they kept ringing in my head. I wish that I could rate this book 10 stars. It’s officially moving into my all time top five. And I am typing that before I have even finished the book. HOW BOUT DAT!? First and foremost, the communication and connection between Esben and Allison in this book is so overwhelming to me. But overwhelming in a good way. Let me try to explain. Most books we read today feel rushed, they feel like there are specific formulas they each follow. I do not like insta-love. I actually cannot sit here and tell you a book that I have liked that has insta-love in it until 180 Seconds. But the premise of the book is what makes it so enjoyable and easy for me to say that. It helps me to sit here and understand HEY! This CAN happen and here is how it happens. So Jessica, you have made me a believer. 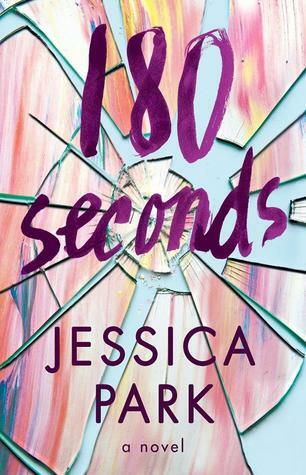 If you are a fan of YA and Jessica’s books Left Drowning and Flat Out Love, you will devour 180 Seconds. It’s almost like Left Drowning and Flat Out Love had a baby and the baby was Esben and Allison and it was a beautiful conception. I hope that every person that this blog reaches reads this book. I hope they read it and experience the taste of blueberry ice cream, the smell of cookies, and oysters and all of the good things that Jessica wants to give to us through not only Esben and Allison but Steffi and Simon and Kerry too. I hope they get the hope and support they so deserve and I hope they find a secure and safe feeling with this book. Because even though I didn’t know I needed it, that is what I found when I finished. And for that I am eternally grateful at the good that can come to and even FROM anybody.